One of the ways to make a small space look bigger is to create an accent wall through use of natural stone veneer panels, slabs, or tiles. An accent wall creates a focal point in the room and helps ground the space by making it less overwhelming for your eyes. As a backdrop for the rest of the room’s design, your accent wall subtly sets the scene for the rest of the room and helps tie the space together. In a living room, the accent wall will typically be the wall behind your sofa or television. In a bedroom, this is the wall your headboard will usually be laid against. The type of material you use for your accent wall will influence the mood, atmosphere and style of the entire space. A simple addition of lightweight and strong natural stone will help elevate your space with a classic and timeless look that will never go out of style. In general, look to using stone veneer for a small studio apartment or an open-concept living room and dining room area. A stone accent wall will help draw attention to the textured elements and natural variations created by nature. Stunning, unique, timeless and sophisticated. More importantly, a stone accent wall will marvel at the full length and height of your space, altering the way you perceive the room’s size and making the entire space appear much larger than it actually is. This is one of the secrets to a designer’s mind: bringing nature into your interiors along with peace and tranquility that often comes with spending time in nature itself. There is no bigger statement than an accent wall that bids and greets through nature’s elements, and no greater investment than by adding some stone materials to your home. From classic to rustic to contemporary, there is a stone veneer for all tastes and match your home’s architectural style. First, consider the style of the stones, and how they fit together. Are they dry-stacked or will be grouted? Are they irregularly shaped and organically spaced or similar in size and evenly spaced? 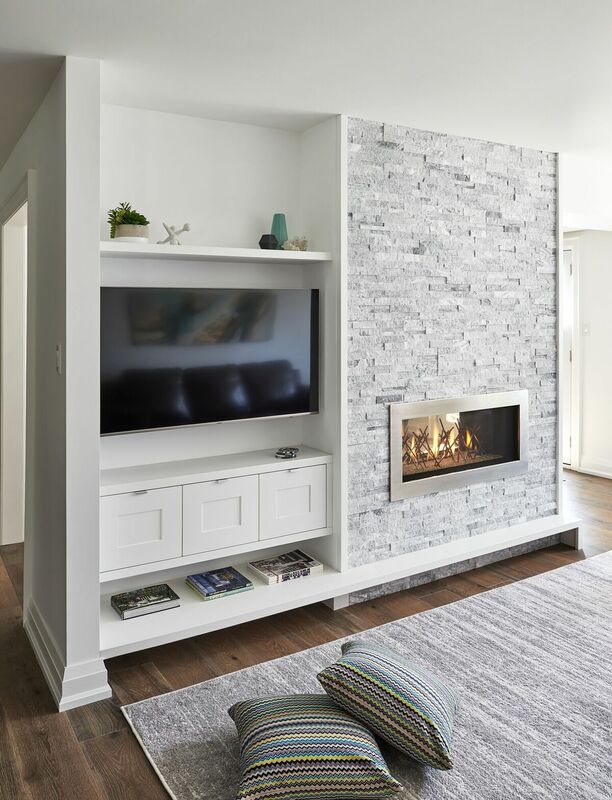 You will find stone veneer products come in full range of colour options ranging from various warm earth tones to the whites, creams brown, sand and taupes as well as the cooler popular modern tones with hints of charcoal greys, blues. This wide variety of color allows you to match any color scheme and design criteria to create a truly personalized interior space. For wall treatments, common types of stone include granite – suitable for areas that are subject to high traffic and to regular wear and tear. Limestone, sandstone and slate are also popular options. For a stronger and more durable surface consider marble, which is formed out of crystallized limestone. The sparkling, smooth, and polished finish of this stone make this a popular choice for reflecting light in small spaces.